Lieutenant Preston D. Fogg could be considered the ultimate "American Boy" Born in Massachusetts to George S. and Pricilla C. Fogg and attending Dorchester High School. He was very active (and I daresay popular) during his college career at Syracuse University, particularly in athletics, he was captain of the 1911 Syracuse Football Team and participated in the one mile relay, winning the IC4A champion twice. Also on this relay team was Olympic athlete Charles D Reidpath. 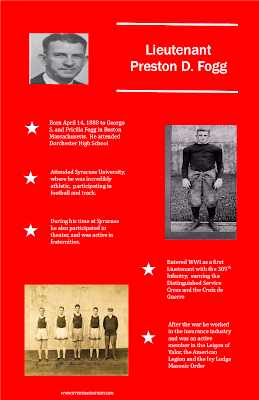 Outside of his athletic activities, he was active in the fraternities Phi Kappa Alpha, becoming president in 1912, president of the Seniors Dinner Club and the first president of the Tambourine and Bones, a musical theater society that produced "The Coach" by DH Wallace. He entered the WWI fray in 1918 as a First Lieutenant of the 309th infantry and during the fighting at Champigneulle in October of 1918 was noted for heroism by carrying a wounded soldier out of battle, while he was also injured. He earned both a Distinguished Service Cross and the Croix de Guerre. After the war, he returned to Syracuse and continued to be an active member of the community, participating in Legion of Valor, the American Legion, and the Ivy Lodge Masonic Order.